Let me just start off by saying that my husband is the best. He has taken this sad little ranch house with its dated rooms and turned it into the home of my dreams! 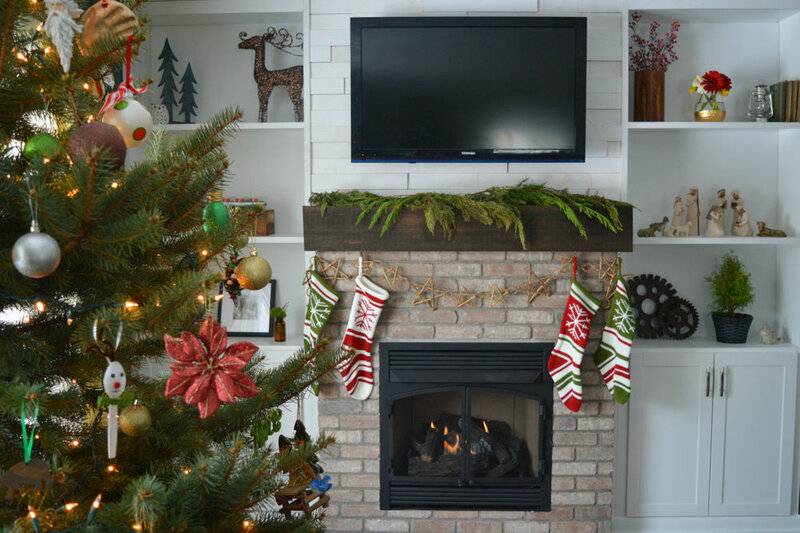 When we first looked at the house while we were on the hunt, I immediately pictured two things for the living room: a big fat Christmas tree sitting in front of the large window and a built in shelf / fireplace feature wall. While we both agreed on the vision, it took a little while to jump in on the project. 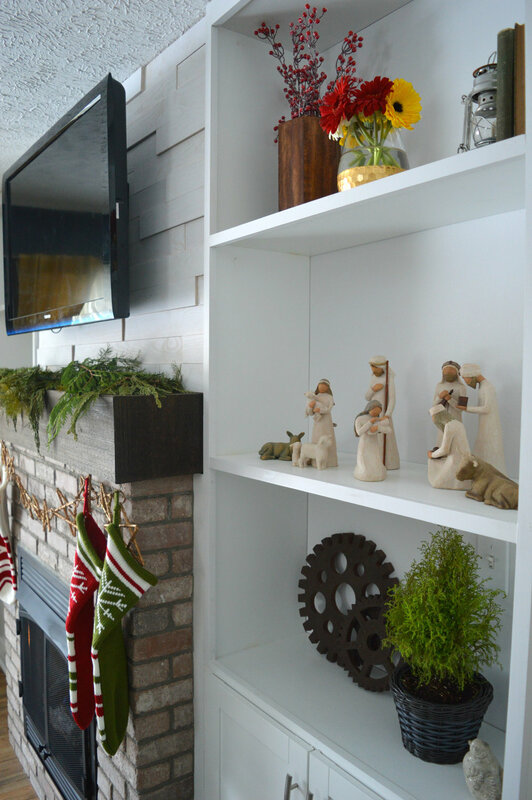 Since I apparently avoided taking “Before” photos of the wall like the plague, here is what we had for the last two years: fresh paint on the walls, a mantle that Luke built from our old house, and a faux-fireplace entertainment center. Not terrible, but not exactly what we knew the room could be. 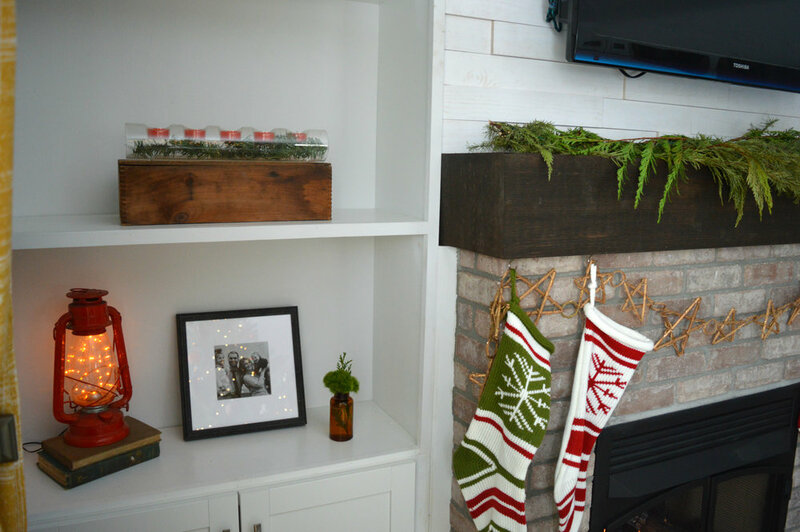 Jump to the “after.” Custom built-in shelves, Timberwall feature behind the TV that is now mounted on the wall, a vent-free gas fireplace insert with brick face surround, and a beautiful rustic mantle – all built by my very talented husband! Please also note the beautiful florals upping my shelfie game c/o BloomsyBox! To say I am obsessed with the end product is the understatement of the century. It makes our house feel so much more like a home and truly brings the room together. My dream was to be able to cozy up near the warm fireplace with a mug of cocoa (or glass of Baileys, if we’re being honest) and the glimmer of the lights on the tree this Christmas, and – like always – my man delivered! Special thanks to Timberwall for supplying us with the materials for the TV feature wall! We used the Landscape collection in Arctic for this project, and you can see how we used Timberwall to build a platform bed for our bedroom here!